Custom pewter curved apron sinks from Handcrafted Metal offer a unique departure from most apron styles. The subtle rounded shape of a curved apron grabs the eye and bends light differently than other sink aprons. 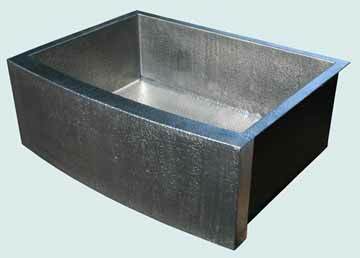 Every sink is made from high-quality pewter for durability, and has coved corners for easy cleaning. Each sink is available with drop-in mount, under mount, or flush mount rims. Also, if you need the apron front of your pewter sink to fit with existing cabinetry, we can make it match perfectly! Click on any sink below to see more pictures, and customize it according to your specifications!